Foundation giving has greatly enhanced Olin’s ability to fulfill its unique mission, funding everything from an innovative fusion of STEM and humanities to novel applications for the visually impaired to a mobile maker space. With a poverty rate of around 35% and median household income half the national average, Coahoma County, Mississippi, has big economic challenges. Add to that a persistent racial divide, and you have almost insurmountable obstacles for many young people trying to break out of the cycle of poverty. Babson, Olin and Wellesley students are trying to change that. Working with local partners under the auspices of Olin’s Affordable Design and Entrepreneurship program in a project with major funding from the Ford College Community Challenge, they are providing novel educational opportunities to help local youth redefine their futures. The focus of their efforts has been creating a mobile maker space — basically a technology- and arts-based curriculum on wheels that can move from community to community, crossing boundaries of geography, race and income. The project is currently running three pilot afterschool programs each serving 8 – 12 students weekly, with many repeat participants. They teach musical instrument making, computing and other skills while encouraging students to think entrepreneurially about their opportunities. The funding from Ford, two grants totaling $45,000, has been instrumental in advancing the project. An educational program staffed by students in Olin College’s Affordable Design and Entrepreneurship program and funded by the Ford College Community Challenge is offering local youth in Coahoma County, Mississippi, skills in instrument making, silk screening, virtual reality applications and other areas. Sara Hendren, artist, designer and researcher in residence at Olin, and the co-principal investigator of the Mellon Foundation grant, likes to say that the grant will help STEM and the arts “walk toward each other.” By that she means that the two often antagonistic fields will find mutually beneficial ways to integrate their insights, helping engineering students ask deeper questions and discover many more career paths than those focused narrowly on STEM pursuits. The arts and humanities, in her view, are not merely enrichment for STEM students. “We want to make sure that they are sufficiently surprised by the people that they meet, that they challenge themselves and that they ask really difficult questions, not just about technology, but about how to spend a good life,” says Hendren. As they design solutions, she wants engineering students to engage with the questions typically asked in the arts and humanities — questions like what should we make, what sort of civilization should we create and how should we act toward each other. The Sketch Model summer workshop provided a three-day immersive experience for college faculty interested in exploring the interplay of arts, humanities and technology. 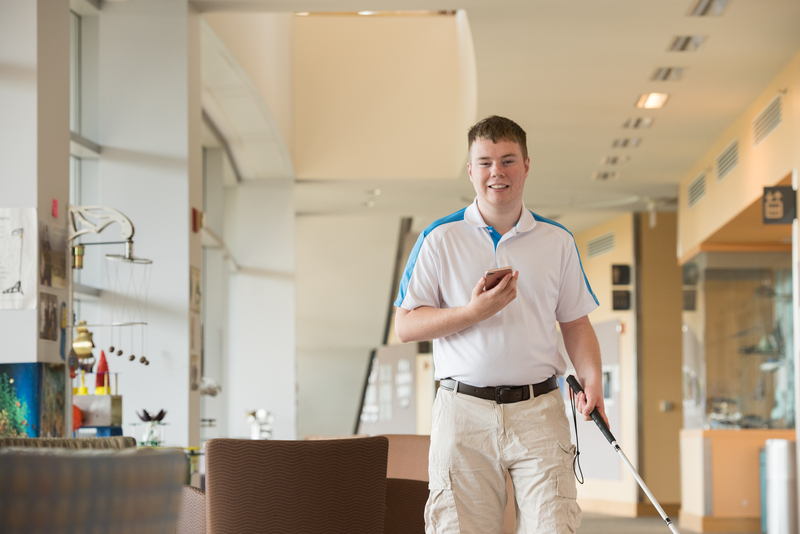 Funded by a $45,000 grant from The Peabody Foundation and working under the direction of Assistant Professor of Computer Science Paul Ruvolo, teams of students from Olin and other institutions worked on mobile applications in summer 2017 to increase the independence and mobility of blind students. Their app, called Clew (meaning a ball of yarn), helps blind users find their way back to a location in a building after someone has helped them to another location, such as a bathroom. Installed on a smartphone, the app provides auditory directions to help the user navigate back to their original location. The app has been released to the App Store, so smartphone users everywhere can download it. As part of a second project funded by the grant, Olin teams worked with students at the Perkins School for the Blind in Watertown, Massachusetts. The goal was to improve orientation and mobility education. Blind students need training in how to use their cane and navigate indoors, which is a lot easier to do when it’s fun. So Paul and his team worked on making the exercise engaging, developing apps that, for example, rewarded students with their favorite sounds if they did the full range of sweeps with the cane. The grant, says Ruvulo, was essential to the projects, providing support for the team members, transportation and equipment, among other needs. “We couldn’t have done it without the grant from The Peabody Foundation,” says Ruvolo. Teams of students from Olin and other institutions worked to improve the independence and mobility of the visually impaired. - In FY 2017, Olin faculty participated in a module based on Quantitative Engineering Analysis, a new course that combines engineering, physics and mathematics. - Olin faculty also experienced Olin’s flagship User-Oriented Collaborative Design course, which particularly benefited faculty who were preparing to co-teach it for the first time the following year. - In FY 2018, there were several course-based modules, including an opportunity to work on Olin-based projects while being immersed for two days in the methods of Olin’s foundational entrepreneurship course, Products & Markets. - Faculty improved their capacity to guide change in education through a variety of workshops of increasing levels of sophistication over the past two years. These workshops ultimately improved Olin’s Summer Institute. “These Davis-funded initiatives have greatly increased our capacity for course development and teaching innovation, both at Olin and beyond,” said Sarah Spence Adams, Olin’s associate dean for faculty affairs and development. Olin faculty, staff and students gathered May 21 – 23 for a workshop to learn entrepreneurial tools for accelerating the pace of organizational change and building collaboration among all segments of the community. Olin College, accustomed to transforming students’ lives and the way engineering is taught, is itself experiencing a transformation, thanks in large part to a multi-year partnership with the Kern Family Foundation. Having completed its second year, the partnership has an overall goal of increasing Olin’s capacity to catalyze innovation and entrepreneurial thinking in engineering education. Where year one focused on the capacity side of the equation — through, among other things, the recruitment of new full-time faculty to boost Olin’s ability to innovate and engage externally — year two has focused on projects and activities that directly impact Olin’s ability to effect change. In FY 18, with support from the partnership, Olin faculty developed a series of videos explaining Olin’s distinctive approach to curricular innovation and entrepreneurship, and highlighting courses that illustrate Olin’s forward-looking teaching methods. It also funded faculty development workshops, so that innovative practices could be shared both internally and externally, and supported improvements to the visitor program and Summer Institute. Additionally, the college became actively involved in the Kern Entrepreneurial Engineering Network (KEEN), a group of 36 schools committed to fundamentally changing the way engineering is taught, through Olin-inspired faculty development workshops at KEEN conferences and assuming leadership positions within the network. And the interesting thing about all that capacity building in year one is the way it is changing the faculty culture and inspiring innovation in areas not directly funded by the Kern grant. That includes everything from a revamped faculty recruiting process to a restructured Academic Life function. “Our partnership with the Kern Family Foundation, and its support, are enabling Olin to greatly increase its ability to inspire and advance large-scale, systemic change in engineering education, with substantive positive effects on student learning and societal impact ,” said Vincent Manno, Olin’s provost. Olin faculty were involved in leadership roles in the Kern Entrepreneurial Engineering Network (KEEN) National Conference in January in Dallas.